I recently purchased this red jumpsuit from Aqua and I have already gotten so much use out of it for events, lunches, and meetings. It's the one piece in my closet that I can turn to for comfort and convenience. If you're in a rush most mornings like me, this piece will save you time and energy. No need to stand in front of your closet staring aimlessly at skirts and dresses wondering how you'll mix the perfect outfit. All you need to do is step into your favorite jumpsuit and head out the door! This sleeveless jumpsuit came in handy last week when I was in need of a quick and fun outfit for the StyleList Fashion Week event in Soho with Jyo from Cuppajyo.com. Jyo is such a sweetheart and I have been following along with her blogging journey for quite some time now. This was our first time meeting and when we showed up to the event...we were both wearing jumpsuits! So if you're not already a fan of the trend, jump on it- or in it ;). Keep scrolling to read my styling tips for accessorizing the jumpsuit, plus get a little behind the scenes from the rooftop of the Mondrian Hotel from the StyleList event. The views were truly amazing! When it comes to accessorizing the jumpsuit, I like to keep the jewelry lightweight. Pair with simple layering necklaces, a thin belt, bangles and strappy shoes. 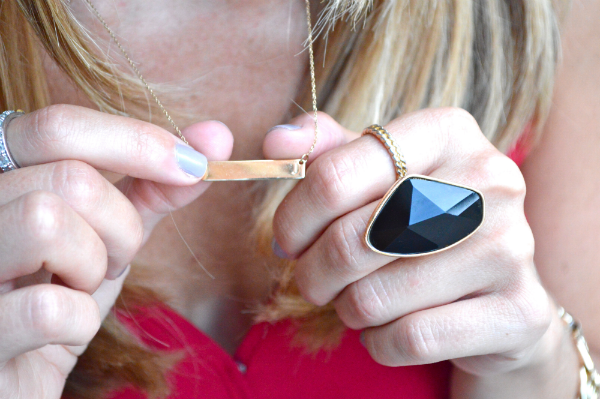 I am currently crushing on gold plated necklaces, as worn by celeb style gurus Lauren Conrad and Kourtney Kardashian. 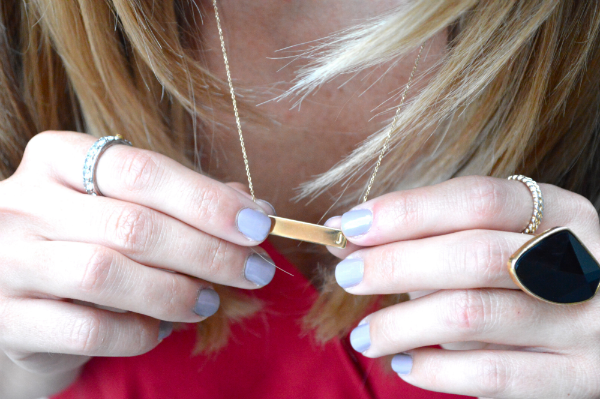 This Gold Bar Initial Necklace from My Monogram Necklace simply dresses up any outfit. I can't wait to wear it in the fall with big chunky sweaters. If you are looking to treat yourself or a friend, this necklace makes a great gift. You can monogram it or put your initials on it as shown below. All photography credit goes to the lovely Jyo of Cuppajyo.com! Cute!! I totally agree with you, I LOVE a jumpsuit. They're so fast, chic, and easy to transition day to night. This one is way cute. Hope you had a great time at NYFW! Had to stop by the blog to emphasize how incredibly you look! You are on point EVERY DAY! Can I just be you? You look AMAZING! Red is definitely your color!